04/12/15 -- EU grains drifted mostly lower on the day and for the week. At the close, Jan 16 London wheat was down GBP1.65/tonne at GBP111.25/tonne, Dec 15 Paris wheat was down EUR1.00/tonne at EUR173.00/tonne, Jan 16 Paris corn was EUR0.25/tonne higher at EUR165.25/tonne, whilst Feb 16 Paris rapeseed fell EUR3.00/tonne to EUR381.00/tonne. For Paris wheat this was the lowest close since Sep 24, and for Jan 16 London wheat it was a lifetime contract closing low. For the week, London wheat fell GBP2.00/tonne, Paris wheat was down EUR3.25/tonne, corn was EUR0.25/tonne lower and rapeseed gained EUR0.50/tonne. It's a little surprising that Paris wheat should find itself languishing at quite such sorry levels given the fact that this week's soft wheat export licence total was a marketing year high 1.04 MMT, an 88% increase on a week ago. That takes the cumulative season to date total to 9.76 MMT. Whist that's down 23% versus this time year ago, just a week ago that figure was -27.5% and two weeks ago it was -30%, so things are finally moving in the right direction. Yesterday's sudden bought of euro strength was relatively short-lived, and had dissipated by mid-morning. 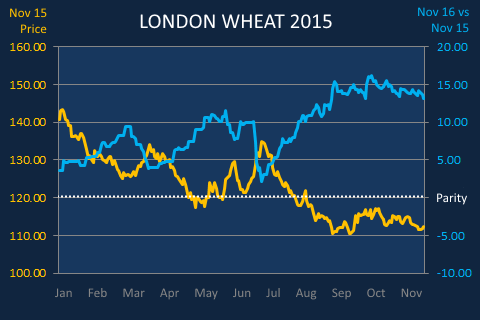 The outlook for 2016 remains bearish for the single currency, so further euro weakness, potentially boosting wheat exports, can be expected in 2016. France picked up 46% of this week's soft wheat export licences versus only 25% the previous week. Brussels only issued 79 TMT worth of barley export licences this past week, although that season to date total is still up 17% on a year ago at 4.66 MMT. Spain said that they'd imported 2.265 MMT of wheat in Q1 of 2015/16, a 5% increase versus the same period a year ago. They also imported 1.251 MMT of corn, up 10% compared to 12 months previously. Spanish wheat production fell 8.8% this year, and corn output was down 11.4% due to drought. FranceAgriMer said that this year's French corn harvest is over. French winter wheat plantings are 99% complete and barley is 100% sown. They said that 57% of the French winter wheat crop is at the early tiller stage versus 44% a week ago and 55% this time last year. 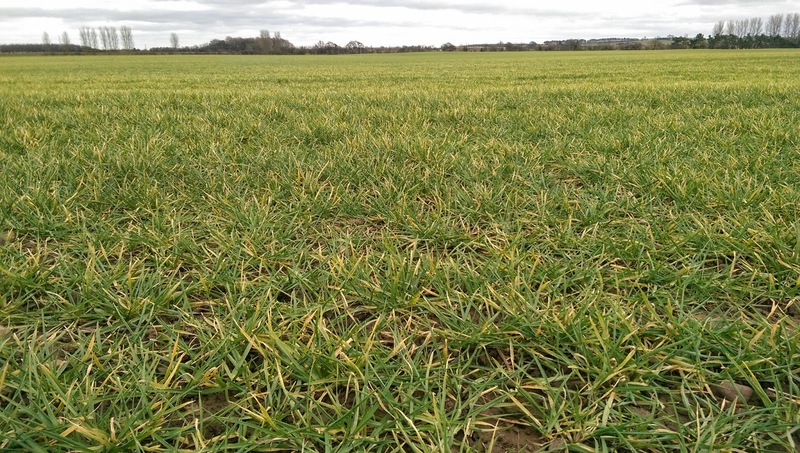 Winter barley is 77% tillering versus 66% last week and 75% a year ago. French winter wheat is seen at 98% good to very good and winter barley is 97% good to very good, both versus 93% a year ago. Depending on who's estimates you want to run with, the UK winter wheat planted area for the 2016 harvest is broadly in line with that of 12 months ago - anywhere from 3% lower to 2.5% higher. Rapeseed plantings are seen declining between 7% and as much as 15%. It's a similar situation in France, with the French Ministry today releasing their first estimates on plantings for the 2016 harvest. They see the French winter wheat area up 1.5% to 5.22 million ha - the largest area sown for 80 years. Winter barley plantings are seen 2% higher at 1.32 million ha, and the OSR area is down 2% at 1.46 million ha, they predict. 03/12/15 -- Soycomplex: Beans closed higher. Weekly export sales of 878,300 MT for 2015/16 are showing signs of tailing off a little, being down 25 percent from the previous week and 29 percent from the prior 4-week average. They were also at the low end of trade forecasts of 800,000 MT to 1.2 MMT. China (521,500 MT) was the main home. Actual weekly shipments of just over 2 MMT were decent. The primary destination again was China (1,349,900 MT). The USDA also reported 132,000 MT of US beans sold to China for 2015/16 shipment under the daily reporting system. The FAO raised their forecast for the global 2015/16 soybean crop by 3 MMT to 322 MMT, which now beats last season's all time high. Ending stocks were reduced by 2 MT however to 49 MMT, but still up 3 MMT versus 2014/15. "In Brazil, planting has begun in most regions and conditions are mostly favourable owing to consistent rainfall in the main producing regions. However, there are some concerns over irregular rainfall in the north and northeastern regions. In Argentina, planting is progressing slowly due to periodic rainfall events but conditions are generally favourable," they said. Informa today estimated Brazil's 2015/16 soybean crop at 101.4 MMT (versus 101 MMT previously), placing Argentina at 58.5 MMT (down from 59.0 MMT previously). Abundant rains are delaying planting progress in Argentina, say the Buenos Aires Grain Exchange. MDA CropCast were unchanged on their forecast for this year's US soybean crop at 3.9 billion bushels. Jan 16 Soybeans settled at $8.97 1/2, up 5 1/4 cents; Mar 16 Soybeans settled at $9.00 1/4, up 5 1/4 cents; Dec 15 Soybean Meal settled at $287.10, up $0.80; Dec 15 Soybean Oil settled at 30.59, up 32 points. Corn: The corn market closed around 6-7 cents higher. The move came despite weekly export sales of 499,400 MT for 2015/16 being down 76 percent from the previous week and 50 percent beneath the prior 4-week average. That was also at the low end of trade estimates of 500,000 MT to 1.1 MMT. Exports of 373,800 MT were also less than thrilling, being down 30 percent from the previous week and 11 percent from the prior 4-week average. The FAO cut their forecast for the world 2015/16 corn crop by 3 MMT from previously to 1001 MMT. Although that's way above the USDA's 975 MMT and the IGC's 967 MMT. Reduced output in China was the main reason. "In Brazil conditions have improved and are mostly favourable owing to rains. Planting of the spring-planted crop (the smaller producing season) is ongoing in most regions. There is some concern in the northeastern region due to dry conditions, and planting will intensify once regular rainfall commences. In Argentina, planting is almost halfway complete and conditions are generally favourable, however, there is some concern due to losses from a hail storm that affected early planted fields in Cordoba and Santa Fe," they said. 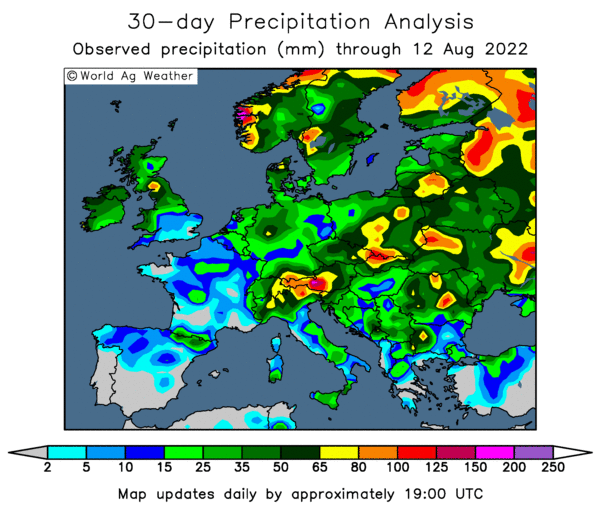 "In Ukraine, harvesting is almost complete and yields are expected to be down due to the persistent dryness and high temperatures in central and western regions in previous months," they added. They placed world 2015/16 ending stocks 5 MMT higher than a month ago at 226 MMT, now just 1 MMT below last season's record, largely due to increases in the US. Informa estimated the Argentine corn crop at 21 MMT, up sharply from its previous estimate of 18.5 MMT. They trimmed Brazil by 0.2 MMT to 81.3 MMT. Dec 15 Corn settled at $3.70 1/4, up 6 1/4 cents; Mar 16 Corn settled at $3.77, up 6 3/4 cents. Wheat: The wheat market closed stronger. Weekly export sales of 392,200 MT for delivery in marketing year 2015/16 were up 29 percent from the previous week and 17 percent from the prior 4-week average. That kind of shows you how poor things have been of late though really. It was mid-range versus trade expectations of 250,000 to 500,000 MT. Interestingly, China accounted for 98,300 MT of this week's business. There were also net sales of 40,700 MT for 2016/17. Actual exports this week were 399,000 MT were up 54 percent from the previous week and 56 percent from the prior 4-week average. The primary destinations were China (98,300 MT), South Korea (53,600 MT), the Philippines (50,400 MT), Mexico (24,700 MT), the United Kingdom (24,100 MT) and Nigeria (23,700 MT). MDA CropCast were unchanged on their US all wheat production estimate at 2.218 billion bushels. The FAO cut the global wheat crop by 1 MMT from last month to 735 MMT due to reduced output in Brazil and Argentina, They were unchanged on ending stocks at 207 MMT, the highest since 2001/02. "The expansion largely reflects an anticipated build-up of inventories in the EU and the US," they said. "In Australia, conditions have weakened leading into harvest owing to below average rainfall and above average temperatures during spring in many cropping regions. In Argentina, conditions improved owing to showers in the main growing regions, and are favourable in most regions except in Santa Fe and Cordoba where damaging hail storms occurred. The crop is in flowering to ripening stages, and harvesting is ongoing in the north. In Brazil, harvesting is mostly complete and conditions are poor. Excessive rain in November and other adverse climatic conditions throughout the crop cycle caused loss of quality and productivity," they said. Dec 15 CBOT Wheat settled at $4.64 3/4, up 12 1/2 cents; Dec 15 KCBT Wheat settled at $4.58 3/4, up 10 1/2 cents; Dec 15 MGEX Wheat settled at $5.22, up 2 1/4 cents. 03/12/15 -- EU grains traded mixed mid-morning with only small movements in either direction in evidence ahead of a much-awaited ECB announcement on interest rates and QE in the eurozone. The ECB did take action, although it perhaps wasn't quite as drastic as the market was expecting, cutting the overnight deposit rate from -0.2% to -0.3% and extending QE stimulus by six months. They left their main interest rate unchanged at a record low of 0.05% as was widely anticipated. This sparked a euro rally, which then completely took away what little wind had been billowing in the sails of Paris grains. 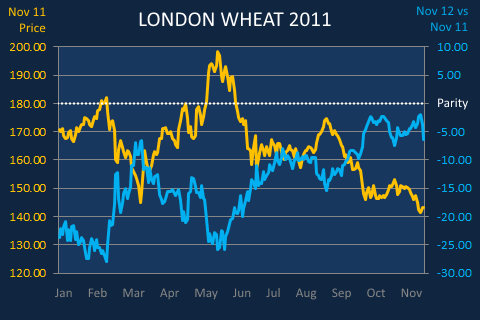 At the close, Jan 16 London wheat was up GBP0.15/tonne at GBP112.90/tonne. In Paris, Dec 15 wheat was down EUR2.75/tonne to EUR174.00/tonne, Jan 16 corn was EUR0.25/tonne higher at EUR165.00/tonne and Feb 16 rapeseed had fallen EUR0.75/tonne to EUR384.00/tonne. The ECB announcement saw the euro rise sharply against both the US dollar (to almost 1.09) and sterling (close to 1.38), and the latter also rose back above 1.50 against the greenback this afternoon too. Market focus now turns to the US non-farm payrolls report out tomorrow, the last one before the decisive December Fed meeting at which many were expecting the US central bank to become the first of the majors to start nudging interest rates higher. Does today's mini-ECB surprise mark a turning point for the single currency? Probably not, much rather an opportunity to book profits just in case the Fed also end up over-promising and under-delivering this month. Deutsche Bank said that a wave of Eurozone capital outflows would see the euro weaken to below parity with the US dollar in 2016 (a view commonly held by many other high-profile analysts), before potentially tumbling as low as 0.85 by the end of 2017. The FAO cut their forecast for the 2015/16 global wheat crop by 1 MMT from a month ago to 735 MMT, mainly due to lower anticipated production in Brazil and Argentina. They were unchanged on world wheat ending stocks at 207 MMT - the highest since 2001/02. "The expansion largely reflects an anticipated build-up of inventories in the EU and the US," they said. Looking ahead to 2016. "Conditions in the northern hemisphere are generally favourable at this early stage of the season. In the EU, conditions improved owing to beneficial weather. In Russia and Ukraine, conditions have improved although some concern over establishment remains," they noted. In Ukraine specifically, "concern remains over winter wheat in the southern and eastern regions due to dryness, which has led to a decrease in planted area and some concerns over establishment conditions. However, conditions are favourable throughout the rest of the country," they added. The Ukraine HydroMet Centre said that decent rains in the third week of November had replenished depleted soil moisture reserves. Lanworth said that there's still everything to play for in Ukraine, despite winter plantings being around 10% below expectations. Improved weather conditions, should they get them, across the remainder of the winter and the spring could still boost final yields and ultimately see 2016 production levels rebound from current low expectations, they suggested. 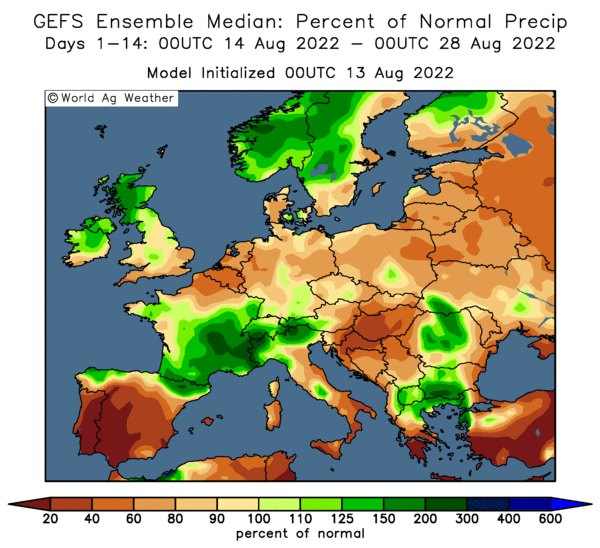 The same could also prove to be true in Russia, where winter grains plantings have managed to reach a little over 95% of the original government forecast. "Winter wheat planting (in Russia) is almost complete. 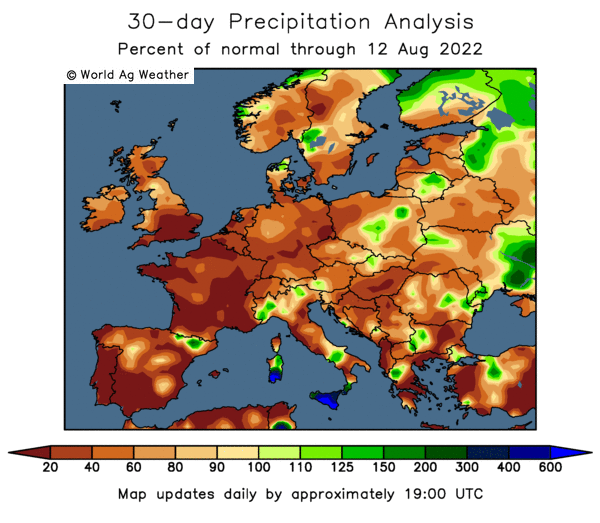 Agro-meteorological conditions for the start of wintering are generally satisfactory and in the southern regions moisture conditions have somewhat improved relative to last month," said the FAO. Russia says that sanctions against Turkey won't be extended to include grains, but traders aren't taking that as gospel. Russian wheat prices on the Azov Sea have fallen around $5/tonne on an FOB basis following last week's downing of a Russian jet that had allegedly strayed slightly into Turkish airspace, as sellers there look for new buyers. There seem to be plenty of willing sellers keen to step into Russia's shoes to supply Turkish needs, although the quality of what is on offer may not be quite as good as Russian material. 02/12/15 -- Soycomplex: Beans, meal and oil all closed with daily gains, with oil faring the best of the three as it continues to bask in the notion that biodiesel will make up much of the newly increased RFS mandate. The USDA reported a private sale of 124,000 MT of US soybeans to unknown destinations for the 2015/16 marketing year. Strong demand for beans continues, with the trade expecting weekly export sales tomorrow of around 800,000 MT to 1.2 MMT to be reported by the USDA. Meal sales are expected in the range of 150,000 to 300,000 MT, and soyoil guesses are 10,000 to 25,000 MT. Monday and Tuesday are public holidays in Argentina and new president Macri takes office on Thursday. The trade is currently of the opinion that he will only gradually remove the 30% tax on soybean exports at the rate of around 5% per year. Jan 16 Soybeans settled at $8.92 1/4, up 3 cents; Mar 16 Soybeans settled at $8.95, up 3 1/2 cents; Dec 15 Soybean Meal settled at $286.30, up $0.60; Dec 15 Soybean Oil settled at 30.27, up 49 points. Corn: The corn market closed around 3 cents or so lower. New Argentine president Macri is expected to quash the export tax on corn more or less immediately, leading to a sudden increase in cheap offers from the South American country. Indeed, Reuters today carried a story that the Argentine corn area might increase by 10% or more following his recent run-off victory, with final plantings increasing from the recently forecast 2.6 million ha to around 2.9-3.0 million, as growers there look to "cash in" on the newly liberated export regime. Weekly US ethanol production came in at 956,000 barrels per day, down from the record 1.008 million barrels/day of the previous week. Thanksgiving may account for some of that decline. Trade estimates for tomorrow's Weekly Export Sales report range from 500,000 MT to 1.1 MMT. 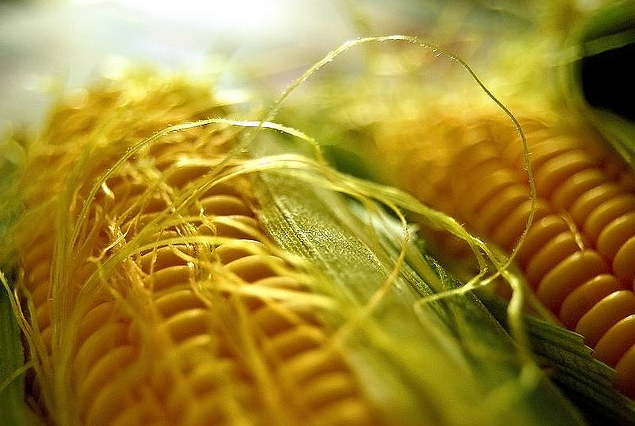 Ukraine said that it had exported 3.3 MMT of grains in November of which more than 50% (1.76 MMT) was corn. Russia said that their corn harvest was now 90.7% done at 12.8 MMT versus 11.2 MMT this time a year ago. Dec 15 Corn settled at $3.64, down 3 cents; Mar 16 Corn settled at $3.70 1/4, down 3 1/2 cents. Wheat: The wheat market closed lower across the three exchanges, with Minneapolis leading the way down for once. Recent gains there may have been a bit overdone. Dec 2015 CBOT wheat posted another new lifetime contract low this morning. Export interest in US wheat remains fairly minimal. Trade estimates for tomorrow's weekly export sales report are a modest 250,000 to 500,000 MT, in line with last week's 303,700 MT. Japan are in the market for their regular weekly tender of 125,600 MT of US/Canadian food wheat with the results due tomorrow, but this is no more than routine business. Conflicting reports remain concerning the Russian/Turkish situation. Just because Russia "says" that there is no wheat export ban to Turkey doesn't mean that there isn't one really. Certainly traders on both sides appear very reluctant to enter into any new business with each other for the time being, for fear of government intervention in the markets. Russian winter plantings are 95.4% complete at 16.3 million ha. Ukraine exported 1.27 MMT of wheat in November. Dec 15 CBOT Wheat settled at $4.52 1/4, down 4 1/4 cents; Dec 15 KCBT Wheat settled at $4.48 1/4, down 3 1/4 cents; Dec 15 MGEX Wheat settled at $5.19 3/4, down 6 1/2 cents. 02/12/15 -- EU grains closed mixed, with fresh news once again thin on the ground. A Bloomberg survey into trader/analyst sentiment on US wheat prices found 4 Bullish; 4 Bearish; 10 Neutral. There may have been a few more bulls if they had been canvassing opinion on Paris wheat price prospects, due to the overwhelming number of traders forecasting further euro weakness/dollar strength in 2016. The session ended with with Jan 16 London wheat down GBP0.40/tonne at GBP112.75/tonne, Dec 15 Paris wheat up EUR0.25/tonne to EUR176.75/tonne, Jan 16 corn EUR0.50/tonne lower at EUR164.75/tonne and Feb 16 rapeseed EUR1.50/tonne firmer to EUR384.75/tonne. Russia said that their 2015 harvest was 99.1% complete at 108.6 MMT in bunker weight. Wheat accounts for 64 MMT of that total off 99.8% of the planned area, and barley adds another 18.3 MMT off 99.9% of the area sown. The ongoing Russian corn harvest is said to be 90.7% complete at 12.8 MMT. A year ago at this time they'd harvested 11.3 MMT of grains, including 62.3 MMT of wheat, 21.2 MMT of barley and 11.2 MMT of corn. Russian winter plantings for the 2016 harvest are complete on 16.3 million ha, or 95.4% of the originally intended area. Ukraine's 2015 grain harvest meanwhile is 99% done at 60 MMT, and winter grain plantings (which exclude OSR) are 90% complete on 6.7 million ha. The Ukraine Ag Ministry said that the country exported 3.3 MMT of grains in November, down 15% from 3.9 MMT in October. Wheat exports are slowing, and those of corn are picking up. Wheat accounted for 38.5% of exports (1.27 MMT) last month, corn 53.3% (1.76 MMT) and barley 6.8% (224 TMT). Kazakhstan joined Ukraine in saying that they would be only too happy to fill any void left by Russia in supplying any of Turkey's agricultural needs, should Russian sanctions bite further. Jordan cancelled their tender for 100,000 MT of optional origin feed barley once again due to lack of interest due to the stringent contract criteria. Reuters reported that Indonesian interest in French wheat is picking up. France were recently reported to have been preparing to load one 50,000 MT cargo - the first such consignment for 6 years - and are expected to add similar follow-up shipments soon, according to the report. That said that up to 400-500,000 MT of French wheat could find it's way to Asia's largest wheat buyer (and in fact the second largest in the world beaten only by Egypt), as Ukraine wheat offers dry up and Australian prices rise due to Aussie dollar strength. Interest in French wheat is also being aided by the falling value of the euro. The pound was also on the defensive too today, crashing well below 1.50 versus the US dollar for a more than 7-month closing low on ideas that the fragile UK economic recovery is losing momentum. 01/12/15 -- Soycomplex: Beans closed higher. Ideas that biodiesel will make up much of the increased RFS mandate was viewed as supportive (ie. improved demand for soyoil/beans). So too was talk of excessive wetness in southern Brazil, a by product of the strong El Nino, could be causing some problems for beans. Further north in Mato Grosso, the leading soybean state, conditions are still dry. "Mato Grosso’s Centre West soybean area received 248 millimeters of rainfall against 450 mm on average for 55% of average. Drought was less severe in the Center East with 61% of normal rainfall for the 90 days through to Nov 30," say Martell Crop Projections. Brazil's Nov bean exports were 1.44 MMT versus only 0.18 MMT a year previously as the weak real supports the market down there. In Brazilian reals local prices are currently around the same as they were when US prices were $15/bu back in the spring of 2014! Jan 16 Soybeans settled at $8.89 1/4, up 8 1/4 cents; Mar 16 Soybeans settled at $8.91 1/2, up 8 1/4 cents; Dec 15 Soybean Meal settled at $285.70, up $1.10; Dec 15 Soybean Oil settled at 29.78, up 68 points. Corn: The corn market closed around 1-2 cents higher. Spillover support from yesterday's friendly ethanol mandate announcement was still around today. The wet weather in southern Brazil is seen being more of a problem for full season soybeans than corn. "The full-season corn acreage in the state of Parana is down 19% compared to last year to the lowest level since records have been kept. Farmers continue to shift their full-season corn to soybeans and plant their corn as a second crop instead of the first crop. The full-season corn is 99% planted and the crop is developing normally," says Dr Cordonnier. Brazilian customs data continues to show their corn exports going well. They shipped out 4.76 MMT of corn in November, down from the record 5.5 MMT exported in October, but still a very respectable volume and one that is higher than just under 3 MMT in November 2014. Both the Russian and Ukraine 2015 corn harvests should be wrapping up this week. Ukraine has wasted no time in offering it's "help" should Russia's sanctions against Turkey spread to grains. Dec 15 Corn settled at $3.67, up 2 cents; Mar 16 Corn settled at $3.73 3/4, up 1 1/2 cents. Wheat: The wheat market closed mixed, with Minneapolis again the strongest leg of the three exchanges. The heavy rains in southern Brazil mean that Parana's wheat crop has been downgraded from 4 MMT to around 3.4 MMT, with much of it probably only suitable for animal feed. "Farmers who managed to harvest their wheat before the onset of the wet weather have been able to sell their higher quality wheat for satisfactory prices. Unfortunately, most farmers are having to cope with not only lower yields and poor quality wheat, but with also low prices," says Dr Cordonnier. "The state's barley crop fared even worse than the wheat. The state is expected to produce only 133,000 MT of barley, which is down 33% from last year's production of 198,000 MT. The way it stands now, Brazil will need to import malting barley and more wheat than they did last year," he adds. ABARES cut their forecast for the Australian wheat crop by 1.3 MMT from their previous estimate to 24.0 MMT, although that's still 0.3 MMT up on a year ago. Jordan finally bought 100,000 MT of hard wheat in their tender. Dec 15 CBOT Wheat settled at $4.56 1/2, down 3 1/2 cents; Dec 15 KCBT Wheat settled at $4.51 1/2, down 5 1/2 cents; Dec 15 MGEX Wheat settled at $5.26 1/4, up 3 cents. 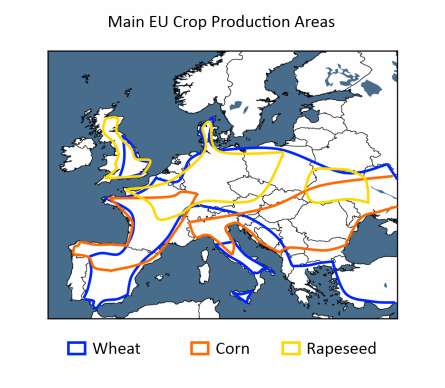 01/12/15 -- EU grains drifted mostly lower. 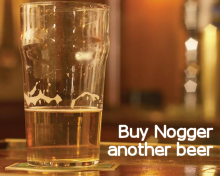 It may have been a new month, but there was little sign of a change of sentiment. At the close, Jan 16 London wheat was down GBP0.25/tonne at GBP113.15/tonne, Dec 15 Paris wheat was down EUR0.25/tonne at EUR176.50nne, Jan 16 Paris corn was EUR0.25/tonne lower at EUR165.25/tonne, whilst Feb 16 Paris rapeseed fell EUR0.75/tonne to EUR383.25/tonne. Fresh news was relatively scarce. The trade is debating what effect a "trade war" between Russia and Turkey might have on the grain markets. On the one hand, Turkey might need some new suppliers to fulfil existing and potential new contracts that would have gone Russia's way. Talk is that some of these wheat requirements might cost $30-40/tonne more on the open world market now. However, Russian sellers will now also need some new buyers for what they already have on contract to Turkey, so there could be some downwards pressure brought to bear too. IKAR said that Russian wheat prices FOB the Azov Sea were down last week on ideas that new, non-Turkish, buyers would now be needed. Turkey are said to have imported 4.2 MMT of Russian wheat and 1.2 MMT of Russian corn in 2014/15. Prime Minister Dmitry Medvedev has apparently signed an decree approving economic sanctions against Turkey following the "unprovoked" downing of a Russian jet over Syria last week. It does not yet seem that these sanctions currently include grain, but traders on both sides are already said to reluctant to enter into fresh deals with each other for fear that this is simply locking in trouble to come further down the line. We shall have to wait and see how this one pans out. In other news, concerns remain over late winter plantings and crop health in Ukraine in particular. The Ukraine Ag Ministry said yesterday that only 649k ha (70%) of the intended winter rapeseed area had been sown. Agritel today said that just 385k ha of this is in a favourable condition. 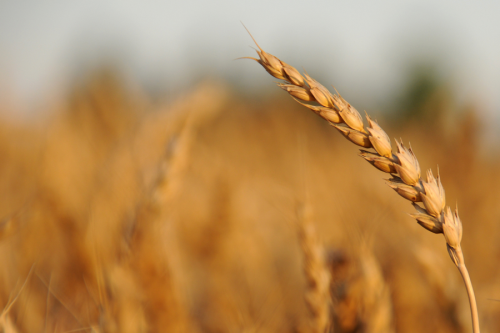 Morocco are tendering on the local market for 150,000 MT of domestic soft wheat. ABARES cut their forecast for the Australian wheat crop by 1.3 MMT from their previous estimate to 24.0 MMT, although that's still 0.3 MMT up on a year ago. They see this year's Australian barley crop up 2% at 8.2 MMT, and have canola production 14% lower at 3.0 MMT. The last full trading day for Nov 15 London wheat was Friday Nov 23, when the contract went off the board at £112.35/tonne. Nov 16 closed at £125.50/tonne that day, putting the long Nov 16 contract at what looks like an unusually large £13.15/tonne premium to the nearby month. Indeed, the far forward Nov 17 adds a further GBP7.00/tonne or so, for an overall premium of over GBP20/tonne compared to the expiring front month. One thing worth noting is that back on Jul 1, the first day of the 2015/16 marketing year, the premium on offer for Nov 16 over Nov 15 was only GBP3.95/tonne. Nov 17 didn't trade until Jul 8 this year, but when it did that contract was only paying a GBP7.40/tonne premium to Nov 15. Both these differentials have therefore widened considerably in the last 4 months. In fact the Nov 15-Nov 16 spread finished at more than 330% of what it was as relatively recently as Jul 1, and the Nov 15-Nov 17 spread has increased to more than 270% of what was on offer on Jul 8. As far as UK growers are concerned, despite the fact that these forward positions are currently offering prices that are substantially higher than those nearby, there’s little interest in selling this far forward. “Why should I sell that, I’m only locking in a loss?” I suspect would be a common retort among the arable fraternity to the suggestion that selling Nov 16, let alone Nov 17, should even be considered. Well, you’d sell spot at that wouldn’t you if the market was offering it? And you’re only locking in a loss there as well. Having nothing sold for 2016 means that you are carrying 100% risk that prices will go up from here. The last 12 months or more have proven that this isn’t necessarily the case. Market price has no respect for your cost of production. So let’s have a look at the last few years in detail, and see if the notion of selling a bit of your 2016 production is quite as crazy as you might think. A casual glance at where market prices where a little over 12 months ago, on the last day of trading of the Nov 14 London wheat contract, shows that anyone selling the forward Nov 15 contract that day would have a sale on board at £137.25/tonne – around £25/tonne better than when the contract expired a day or two ago. Nov 15 was incidentally a £15.25/tonne premium to the nearby Nov 14 that day, not too much different to the premium on offer recently. Indeed, it’s only really in the last 18 months or so that a premium of anything like this sort of nature has been available for the 12 months hence long Nov contract. Cast your mind all the way back to 2010. 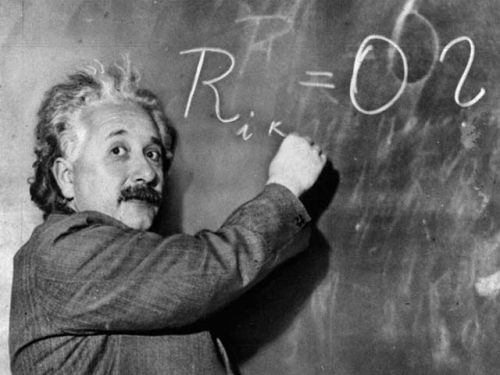 Apple released the first iPad; Volcanic ash from Iceland brought chaos to the European aviation industry; Wolves, Blackpool, Bolton and Birmingham City were in the Premier League; London wheat was trading in the £90’s. The market became aware of a major drought in Russia around June of 2010. By August President Putin had announced an export embargo on wheat. 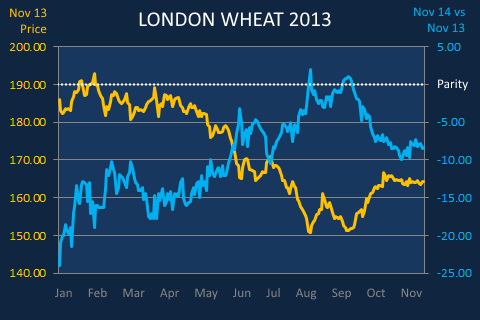 By the close of the year front month London wheat close a pound off £200/tonne. The Nov 11 contract was trading between parity and a £10/tonne premium throughout the first half of the year. As soon as the market began to shoot up, that differential plunged to a discount of around £20-30/tonne. Fast forward to 2011. A busy year. The Japanese earthquake/tsunami; the Royal Wedding; Bin Laden and Gaddafi killed; Amy Winehouse refuses once and for all to go back to rehab. It was also a volatile year in the grain markets. 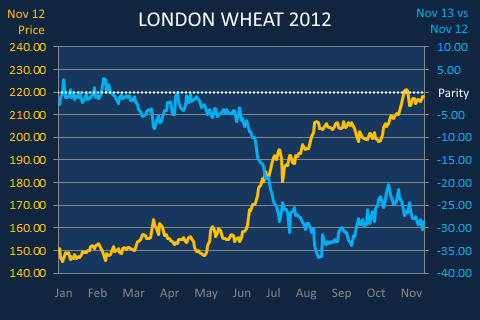 Nov 11 London wheat almost hit £200/tonne before capitulating and closing the year at little more than £140/tonne. The long Nov 12 was a discount to the nearby Nov 11 for the entire year – and by £25/tonne or more on occasions. Twelve months down the line, 2012 was a year almost identical to 2010. Wheat prices steady around the £150/tonne mark throughout the first half of the year, rose rapidly to trade in excess of £200/tonne in the final quarter, as Russia suffered its second serious drought in the space of three years. The long Nov 13 contract, which was trading around parity to the Nov 12 contract during the first half of the year, suddenly slumped to a discount of around £25-35/tonne as nearby prices shot up. Another volatile year in the global grain markets, and one that was similar to that of 2011. The world’s first ever production year In excess of 700 MMT saw London wheat prices slump from in excess of £190/tonne to around £150/tonne at harvest-time. Again, as prices declined, the price differential between the nearby Nov 13 and the forward Nov 14 position improved. The long Nov 14 contract began the year trading at a discount of almost £25/tonne to Nov 13, before steadily improving to actually offer a small premium around harvest-time, before slipping back to around £7-10/tonne under towards the expiry of the Nov 13 month. A year that is perhaps fresher in the mind, and also another that clearly illustrates the trend that high(er) wheat prices generally mean lower forward premiums are on offer. Nov 14 London wheat peaked at around £160/tonne in the spring, following Russia’s annexation of Crimea and subsequent support of rebels in the east of Ukraine. As a second successive record global wheat loomed though, and tensions between Russia and the West eased, world and London wheat prices declined to post a harvest low of sub-£110/tonne. The long Nov 15 contract had been trading at a discount to the nearer Nov 14 contract at the height of the Russian/Ukraine nervousness. That had risen to around a £15/tonne premium by the end of the year. And so to 2015, our current year. Prices aren’t far off the lowest levels that we’ve seen during the entire period under review, so it’s maybe not surprising then that the long Nov premium on offer is close to being the highest that we’ve seen during this time. What, if anything does all this tell us? It seems clear that when the market considers that wheat prices are high, then the prices on offer further forward reflect the assumption that things won’t stay this good for ever – and usually with good reason as they don’t! This doesn’t necessarily mean though that selling a long way forward at a substantial discount to what’s on offer “today” is a bad move. 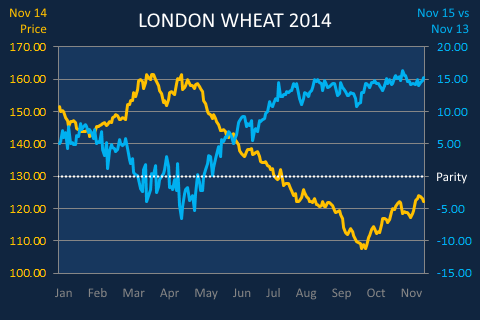 Back in Nov 2012 you could have forward sold Nov 14 London wheat at GBP175/tonne, but very few did. Why? Well spot wheat was making GBP220/tonne back then, so GBP175/tonne (even though it guaranteed a healthy profit unless yields were an unheard of disaster) was viewed as locking in a loss. Similarily, when prices are low (as they are now), the market will often dangle the grower a bit of a forward carrot - a £10-15/tonne premium to sell wheat 12 months or more hence. The price might still be considered low by the grower, but a £10-15/tonne premium is still guaranteed extra money in the bank when the time comes – money that may well not be ultimately on the table when the combines start rolling. Look at where the price of spot wheat is now, and look at the Nov 16 price. If you sell Nov 16 and it ultimately proves to be the worst sale on your books and the market does nothing but go up from here would you be happy? I would be if I was you. Tick. It would also mean that all the unsold 2015 crop that you have sitting in the barn should move up in price too. Tick. If, on the other hand, the market repeats the last 12 months in the next 12 then you'll at least have some wheat sold at 13 quid over the market next year. Tick. Banking a bit of the extra seven quid or so premium on offer for 2017 might not be a bad idea either. 30/11/15 -- Soycomplex: Beans closed higher on continued strong demand. Weekly export inspections of 1.835 MMT were pretty decent and take the season to date total to just shy of 20 MMT. Talk out of Argentina is that new president Macri will not wipe out the 30% export tax on beans in one fell overnight swoop. This will be phased in gradually at 5% per year. That might not mean the sudden glut of Argentine beans coming onto the market that the trade expected. Brazilian soybean planting is estimated to be 81% completed, up 10 points from last week but still lagging a year ago. Weakness of the Brazilian real means that farmers there are already well sold on their 2015/16 crops. Brazilian growers are said to have around 45% of their anticipated soybean production forward sold compared to 26% last year and 40% on average at this time. Mato Grosso is 53% sold compared to 25% this time last year according to IMEA. Parana is 30% sold compared to just 6% last year. 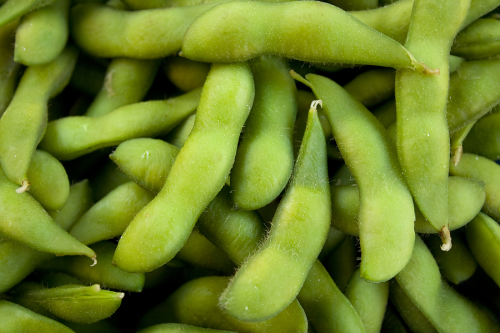 Jan 16 Soybeans settled at $8.81, up 8 cents; Mar 16 Soybeans settled at $8.83 1/4, up 7 3/4 cents; Dec 15 Soybean Meal settled at $284.60, up $2.20; Dec 15 Soybean Oil settled at 29.10, up 35 points. Corn: The corn market closed around 5 cents higher. Weekly export inspections of just 298,692 MT were poor. Season to date exports are now 26% down on this time last year at 6.7 MMT. The EPA released its updated RFS mandate today, That increased the amount of corn based ethanol used in biofuel from 13.61 billion gallons in 2014, to 14.05 billion in 2015, to 14.5 billion in 2016. In Brazil, farmers in Mato Grosso "have forward contracted 50% of the anticipated safrinha corn production compared to 0% last year at this time. Some of the more aggressive farmers, who have contracted as much as 60% of their anticipated corn production, are now very concerned if they will be able to meet those commitments due to delays in soybean planting and subsequently delays in the safrinha corn planting," said Dr Cordonnier. Ukraine said that it's 2015 corn harvest was 95% complete at 21.82 MMT. APK Inform said that Russian seaports had shipped out 156.6 TMT of corn last week. The Russian Ag Ministry said that the country's grain exports to Nov 25 this season are 15.95 MMT of which 1.2 MMT was corn. Rabobank said that forex rates will have a bigger influence on agri-commodity market prices in 2016 than ever before. ABN Amro forecast the US dollar rising to 1.28 against the pound and 0.95 versus the euro by mid-2016. Dec 15 Corn settled at $3.65, up 5 3/4 cents,; Mar 16 Corn settled at $3.72 1/4, up 5 cents. Wheat: The wheat market closed mixed, with Chicago the weakest leg and Minneapolis the strongest. There was also a marked disparity between where the nearby contracts ended the day and the forwards. Reports out of Argentina suggest that the new Ag Minister will be looking to abolish export taxes on wheat and corn with more or less immediate effect. Weekly US export inspections of 275,736 MT were uninspiring. The season to date total is now 16% below last season's pace at this time. The USDA reported that US winter wheat conditions improved by 2 points this week, to 55% good to excellent. Russian seaports were reported to have shipped out 471.5 TMT of grains last week, down from 525.9 TMT the previous week, of which 260.6 TMT was wheat. Ukraine said that their winter wheat crop is 91% sown on 5.64 million ha. 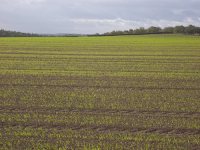 The winter barley crop is still only 84% sown, due to adverse weather conditions. Rusagrotrans said that Russia may have to redirect around 1.6 MMT of grains scheduled for shipment to Turkey due to uncertainties following the recent dispute between the two nations. Turkey are said to have accounted for 18% of all Russian grain exports in 2014/15, and for their part Russia supplied 70% of all of Turkey's grain imports - so the two are important trading partners. Vessels sailing under the Russian flag are said to now be experiencing difficulties entering the Bosporus Strait. Dec 15 CBOT Wheat settled at $4.60, down 5 3/4 cents; Dec 15 KCBT Wheat settled at $4.57, up 7 cents; Dec 15 MGEX Wheat settled at $5.23 1/4, up 13 1/4 cents. EU Grains Mixed, Does Forex Market Hold Key To 2016? 30/11/15 -- EU grains closed mixed, but mostly a touch higher on the day, with rapeseed regaining the "yellow jersey" position and closing with the largest advances on continued production concerns for 2016. The day ended with Jan 16 London wheat up GBP0.15/tonne at GBP113.40/tonne. In Paris, Dec 15 wheat rose EUR0.50/tonne to EUR176.75/tonne, Jan 16 corn was unchanged at EUR165.50/tonne and Feb 16 rapeseed gained EUR3.50/tonne to EUR384.00/tonne. For the month of November, London and Paris wheat and corn all down for the month, with only Paris rapeseed closing higher. The pound fell below 1.50 against the US dollar at one point today, a close there would have been the first beneath that level in more than 7-months, before recovering a little late on. Nevertheless, sterling remains "wobbly" against the US currency in particular, although the jungle drums are now starting to beat that pound strength may have run its course against even the euro as well, and that a downturn there is now on the cards for 2016. Rabobank said that forex rates will have a bigger influence on agri-commodity prices in 2016 than ever before. If they are correct, and forecasts from some of the major bank/analysts hold true, then that might provide a bit of support for London wheat going forward. ABN Amro said that sterling would be the weakest of all the major currencies in 2016. They say that the UK government will likely hold a referendum on a "Brexit" in Q3 of 2016, and a Bank of England interest rate rise is unlikely prior to that. The market had been factoring in a rise early in 2016. Their favourite month for the first UK rate rise in years is now not until November next year. As such they see the GBP/USD exchange rate falling to 1.28 by mid-2016 and 1.25 in Q3 before recovering a little to 1.27 in Q4. That's way below where most other analysts line up. A recent Reuters survey put the GBP/USD rate at an average 1.5234 in mid-2016. ABN Amro are also bearish on the GBP/EUR, seeing that at 1.41 in Q1, before falling to 1.35 in Q2 of next year and 1.3150 in Q3. 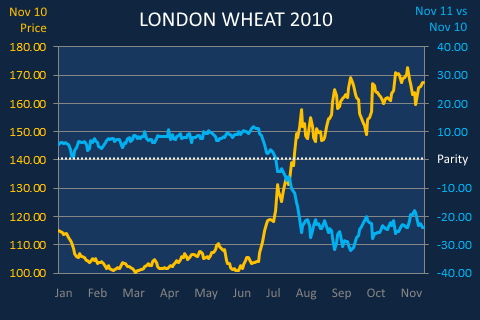 That could see London wheat benefit against not just the market in Chicago, but also compared with Paris wheat once we get towards the middle of next year. As far as the EUR/USD exchange rate goes though, the US dollar is seen out-performing the single currency, hitting parity in Q1 of next year, before falling to 0.95 in Q2 and beyond, by ABN Amro. That largely concurs with Barclay's view of parity in Q1 and 0.98 in Q2 of 2016. This trend would see Paris wheat fare better than the Chicago market in the first half of 2016, and most probably beyond that. Debate continues as to the size of UK wheat and rapeseed plantings for the 2016 harvest. Origin Enterprises estimate the UK wheat area at 1.9 million ha, up 2.5% on a year ago, and a bit higher than the HGCA's suggested 1.825 million. In contrast they see OSR plantings down 12% at 572k ha versus 565k from the HGCA. United Oilseeds were even more bearish at 536k ha, a 15% decline year-on-year, last week. 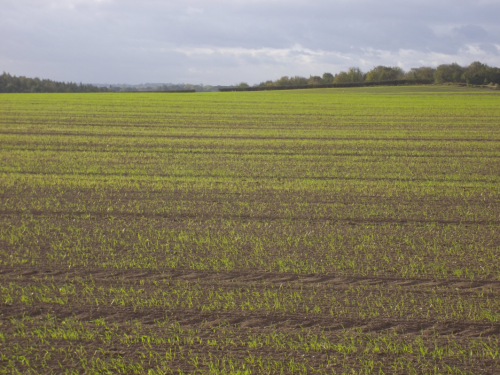 Winter crops in the UK are generally well established and in excellent condition though, Origin said. In Ukraine, bits and bobs of winter plantings are still going on apparently. The Ag Ministry there say that 6.67 million ha of the originally intended area has now been sown (90% of the government forecast). That includes 5.64 million ha of wheat (91%) and 879k ha of barley (84%). Growers there have still only planted 649k ha (79%) of their originally intended winter OSR area. Crop conditions and emergence in Ukraine are also well below year ago levels. Some are already talking of a wheat crop of only 17-19 MMT versus 27 MMT in 2015. The fall out from the Turkish shooting down of the Russian fighter jet last week continues. Russia supplied 70% of Turkey's grain import needs last season, and 90% of them in Q1 of 2015/16. Sellers in Russia and buyers in Turkey are both said to be shying away from entering into new deals with each other for fear of restrictions being introduced that will only make the contracts more difficult to execute. There are reports today of vessels carrying the Russian flag facing delays entering the Bosphorus Strait. Rusagrotrans said that Russia may have to re-direct around 1.6 MMT of grains intended for Turkey to other locations. The Turkish buyers of these commodities may also be forced to look elsewhere for suppliers. 27/11/15 -- Soycomplex: Beans closed a touch lower on the day, but higher for the week. Meal was a loser on both the day and for the week, and is currently the weakest leg of the complex. The USDA reported weekly export sales of 1,173,600 MT for 2015/16, down 35 percent from the previous week and 18 percent below the prior 4-week average. China (751,700 MT) was unsurprisingly the largest home, although the Netherlands (141,500 MT), Japan (76,200 MT), Turkey (67,800 MT), Taiwan (63,100 MT) and Spain (61,100 MT) were also featured buyers. Exports of 1,912,600 MT were down 16 percent from the previous week and 20 percent below the prior 4-week average, but still pretty decent. The primary destinations were China (1,297,400 MT), the Netherlands (141,500 MT), Taiwan (73,600 MT), Spain (61,100 MT) and South Korea (57,900 MT). Dryness in parts of Brazil is still a problem. In the northeastern part of Mato Grosso state, IMEA say that soybean planting is only 66% complete. "Even in central Mato Grosso planting has been delayed as much as thirty days compared to normal and farmers are concerned that the soybean yield potential may have already been compromised," says Dr Cordonnier. Meanwhile wetness in the south of the country has also spilled over into neighbouring Argentina. Here the current soybean seeding pace is the second slowest since 2005 due to the persistent cool/wet planting period, with the greatest delays in the state of Cordoba. Ukraine said that their 2015 soybean harvest is over at 3.76 MMT. Ukraine winter rapeseed emergence is only placed at 86%, of which 32% is rated weak/thinned. Jan 16 Soybeans settled at $8.73, down 2 1/4 cents; Mar 16 Soybeans settled at $8.75 1/2, down 2 1/4 cents; Dec 15 Soybean Meal settled at $282.40, down $2.40; Dec 15 Soybean Oil settled at 28.75, down 14 points. For the week, Jan 16 beans were 15 1/2 cents higher, Dec 15 meal was 60 cents lower and Dec 15 oil gained 85 points. Corn: The corn market closed around 5-7 cents lower on the day, and with losses of 2 1/2 to 4 cents on the week. Trade was thin as it frequently is on the day after Thanksgiving, with many traders taking the opportunity to have an extended break. Weekly export sales of 2,036,300 MT for 2015/16 were a marketing-year high, and up noticeably from the previous week and from the prior 4-week average. Increases were reported for Mexico (1,112,100 MT), unknown destinations (269,100 MT), Japan (196,700 MT), Colombia (88,600 MT), Peru (79,300 MT) and South Korea (73,200 MT). There were also impressive sales of 528,500 MT for 2016/17 for Mexico (487,700 MT) and Japan (58,900 MT), with a few downwards revisions for Panama (-13,500 MT) and Nicaragua (-4,600 MT). Exports of 531,700 MT were up 37 percent from the previous week and 34 percent above the prior 4-week average. The primary destinations were Mexico (281,400 MT) and Colombia (116,700 MT). Ukraine said that their 2015 corn harvest was 95% done on 3.9 million ha for a crop of 21.82 MMT to date. The USDA have final production there at 23 MMT. France said that their corn harvest was 99% complete versus 97% a year ago. The EU Commission estimated the EU-28 corn crop down 26.2%, or -20.4 MMT, at 57.5 MMT. They see EU-28 corn exports in 2015/16 at 2.5 MMT versus 4.0 MMT last season. Reuters reported that China is to cut government support prices for corn by a further 10%. This will likely result in reduced Chinese sorghum, DDGs and barley imports, traders say. The FAO estimated China's 2015 corn crop at 221 MMT, down 4 MMT from previously and also 4 MMT below the current USDA estimate. Dec 15 Corn settled at $3.59 1/4, down 6 3/4 cents; Mar 16 Corn settled at $3.67 1/4, down 5 1/2 cents. For the week, Dec 15 corn was 4 cents lower and Mar 16 lost 2 1/2 cents. Wheat: The wheat market closed lower on the day, but mixed for the week. Chicago wheat is the weakest leg and Minneapolis the strongest. The USDA reported weekly export sales for wheat of 303,700 MT for delivery in marketing year 2015/16, down 58 percent from the previous week and 23 percent below the prior 4-week average. There were also sales of 22,000 MT for 2016/17. On old crop unknown destinations (109,600 MT), Mexico (63,600 MT), Japan (50,300 MT), South Korea (38,600 MT) and the United Arab Emirates (25,000 MT) were featured buyers. The market continues to get information like this highlighting what everybody already knows - US wheat is simply too dear to feature into all but traditional (and usually nearby) homes. The EU Commission estimated this year's EU-28 soft wheat crop at 149.1 MMT, down slightly from 149.2 MMT a month ago, but up a tad on 148.7 MMT a year ago and a record crop. They see EU-28 soft wheat exports in 2015/16 at 27.9 MMT, a 16.2% drop compared to 33.3 MMT in 2014/15. EU-28 2015/16 soft wheat ending stocks will leap 6.6 MMT to 17.5 MMT, they predict. Russia's Ag Ministry dropped their forecast for the 2015 grain crop there by 0.5 MMT to 101.5 MMT in clean weight. That's down 3.6% on a year ago, although that was a post-Soviet era record. Their 2015 harvest is said to be now 99% complete at 108.3 MMT in bunker weight. That includes 64.0 MMT of wheat and 18.3 MMT of barley. France said that it's winter wheat crop for the 2016 harvest was 99% sown, 94% emerged and 44% at the early tillering stage. They estimate that 98% of the crop is currently in good to very good condition versus 93% this time a year ago. Dec 15 CBOT Wheat settled at $4.65 3/4, down 13 1/2 cents; Dec 15 KCBT Wheat settled at $4.50, down 7 1/4 cents; Dec 15 MGEX Wheat settled at $5.10, down 4 1/2 cents. For the week, that means that nearby Chicago wheat fell 22 3/4 cents, with the market in Kansas 7 cents lower and Minneapolis up 1 1/4 cents. 27/11/15 -- EU grains closed lower across the board on the day, but mixed for the week. Rapeseed was the sole gainer compared with last Friday, despite falling 5 euros today, as the result of strong advances seen earlier in the week. The session ended with with Jan 16 London wheat down GBP0.75/tonne at GBP113.25/tonne, Dec 15 Paris wheat down EUR0.75/tonne to EUR176.25/tonne, Jan 16 corn EUR1.00/tonne lower at EUR165.50/tonne and Feb 16 rapeseed EUR5.00/tonne weaker to EUR380.50/tonne. For the week, Jan 16 London wheat was GBP0.95/tonne lower, Dec 15 Paris wheat was unchanged, Jan 16 Paris corn was EUR1.50/tonne lower and Fen 16 Paris rapeseed gained EUR3.50/tonne. There hasn't been a great deal of fresh news this week. The market continues to debate the state of winter grains in Russia and Ukraine, and the implications for crop production there in 2016. The outlook for lower EU and Ukraine rapeseed production next year, once more, is also in traders' minds, along with how the spat between Russia and Turkey will pan out amidst talk of a trade embargo. Russia's president Putin has described the downing of the Russian jet as a "stab in the back", and warned of "serious consequences" to come for Turkey. They currently import around 5 MMT of grains per annum from Russia. A hangover from record world wheat, corn and soybean output this year, and the potential for bumper crops again in 2016, weighs though. World stocks are also at very high, and in some cases at record levels too. The EU Commission today estimated the total grain crop here this year at 308.5 MMT, down 6.3% on last year. This year's soft wheat crop is now seen at 149.1 MMT, up a tad on 148.7 MMT a year ago. Barley production is also a bit higher at 60.8 MMT versus 60.2 MMT in 2014. The EU-28 corn crop is sharply lower however, down 26.2%, or more than 20 MMT, to 57.5 MMT. They see EU-28 cereal consumption at 283.9 MMT versus 281.7 MMT in 2014/15, and exports at 42.1 MMT against 51.7 MMT last season. Soft wheat exports will total 27.9 MMT, a 16.2% drop compared to 33.3 MMT in 2014/15. Barley exports will tumble 21.3% to 10.0 MMT and those for corn will drop 37.5% to 2.5 MMT, they estimate. EU-28 2015/16 cereal ending stocks are seen at 45.3 MMT versus 46.1 MMT at the end of last season, of which soft wheat stocks will leap 6.6 MMT to 17.5 MMT, they predict. FranceAgriMer said that the French winter wheat crop was 99% sown, 94% emerged and 44% at the early tillering stage (all around the same levels as a year ago) as of Monday. The French winter barley crop was 100% planted, 99% emerged and 66% tillering, again very similar to the situation 12 months ago, they added. The French corn crop is all just about in at 99% done. Winter wheat crop ratings are 98% good to very good, 5 points up on this time last year. French winter barley is 97% good to very good versus 93% a year ago. Bloomberg reported that United Oilseeds estimate the UK rapeseed area at 536k ha, down 15% on a year ago and 29k ha less than the HGCA's early bird survey recently suggested. They see production in 2016 at 2.0 MMT, a 17% decline compared with this year and the smallest crop since 2009. The Ukraine Ag Ministry reported that winter grains had so far emerged on only 5.3 million ha, or 80% of the planted area. Of the area that had germinated, only 64% is rated as being in good to satisfactory condition. That leaves 1.3 million ha of cropland so far yet to emerge, and an additional 1.9 million ha of winter grains in weak/thinned condition. This doesn't include winter rapeseed. For that the Ministry say that 557k ha (86%) of what got planted has emerged, of which 32% is weak/thinned, meaning that 46% of winter OSR sowings are rated poorly or still haven't germinated at all yet.